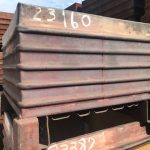 Metal Bins | Used Steel Totes | Industrial Wire Baskets | Plastic Bins RDR Steel Sales – Specializing in pre-owned and new steel and plastic totes, shipping baskets, shipping containers, metal bins, steel bins and industrial wire baskets. Industries across North America trust us in providing the best products and exemplary customer service. After serving the steel industry for over 40 years, there is no company better to serve your various needs of material handling products. There are many different industries that use our steel containers to transport materials. It is our priority to make your job run smoother and more efficient. 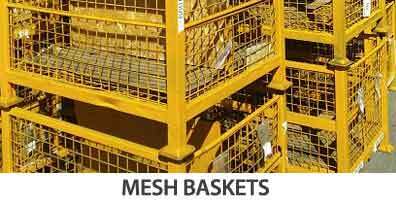 Take the work out of work with easy to use mesh baskets and solid steel bins. Most containers are made of mesh, solid, rigid, and collapsible structure. The collapsible plastic bins are excellent for storing out of the way and saving freight costs when returning back to the shipper. Make lifting and shifting materials easy with the self dumping hoppers. It prevents on the job injuries, keeping your employees safe. 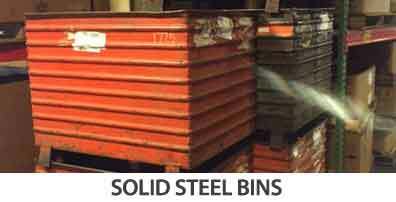 Corrugated steel totes are great for the storage and transport of heavier products. If the storage is lighter, the plastic totes will work well. Our prices for containers and freight are very competitive, your products will be delivered with timely service to the United States and Canada. 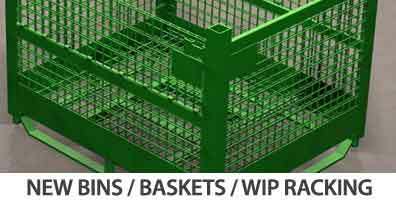 Time is money, and working smarter rather than harder is important, making the investment in our containers and baskets help you get the job done quickly and efficiently, and the money spent will quickly find its way back into your budget. If you have ever worked in a shipping department, you understand that lifting is a primary part of the job. Using our convenient corrugated boxes, you can take advantage of their light weight and ease of use. Best of all, they are manufactured using quality raw materials. Ours come in a vast array of shapes and sizes to accommodate even the most specific needs. 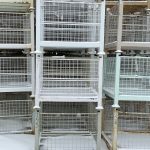 If you have packaging that must endure more intricate processing or manufacturing, our steel mesh / solid bins are durable and made with quality in mind. You are sure to be pleased with their high stability when used for heavy steel products. 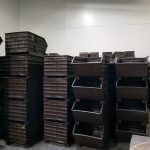 Space on your production floor is crucial in maintaining the flow of a functioning shipping and receiving department, and we can help you free up some much needed space with our quality collapsible steel bins. 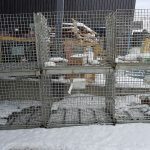 With these pallets, you have the ability to collapse them when they are not in use. They also offer protection for their contents, allowing you to avoid the need to find the right packing solution for fragile items. Best of all, these metal bins are reusable, allowing you to take advantage of your investment time and time again. 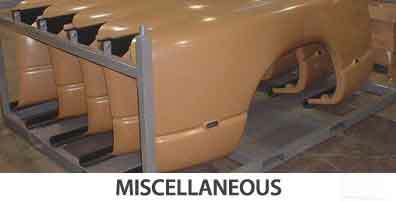 If you are looking for a solution in moving and placing parts for assembly, we have you covered there, too. 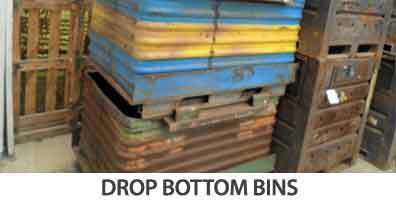 Our drop bottom containers allow operators the convenience of having the parts they need for assembly to be discharged through the bottom of the container, and this leads to higher production. We offer a variety of sizes to meet your needs. We understand that you are in business to make money, and we want to help you utilize your investment funds wisely. We offer a variety of products that save you time, space and money over the long term. Best of all, you don’t have to leave your home or office to acquire the containers you are looking for. Our easy-to-navigate website makes it easier than ever to quickly find what you are looking for. 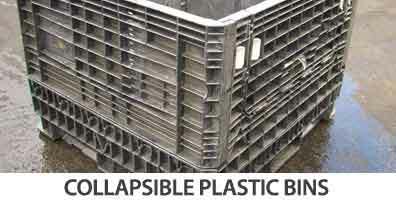 Some common search terms include: steel totes, shipping baskets, shipping containers, metal bins, steel stackable baskets, steel stackable containers, steel shipping bins, steel stackable shipping bins, steel stackable shipping baskets, steel stackable shipping containers, stackable mesh baskets, stackable mesh containers, wire mesh containers, wire mesh baskets, solid steel shipping bins, plastic collapsible containers, steel baskets, steel containers,bulk containers, used collapsible containers, used collapsible bulk boxes, used collapsible bulk containers, Plastic containers, used plastic bulk boxes, used pallet containers, refurbished bulk boxes, plastic folding bulk containers, used bulk boxes, used bulk containers.